Leed Himmel is capable of highly efficient parts cutting and punching. Our state-of-the-art CNC capability are greater than ever. We have the capability to cut, stamp, and mill with our new state of the art Phantomatic T3 Star machining center. CNC machining center with 4 controlled axes, designed for machining operations on bars or workpieces made of aluminum, It is provided with a 4-place tool magazine, capable of containing 2 angle machining heads and a side milling cutter, for machining on the 5 faces of the workpiece. The presence of a continuously rotating work table (N/C axis) allows machining at any angle from 0° to 180° and on the two ends with the two-way angle machining head and with the table at 0°, allowing us to turn out small to mid-size runs with great precision and speed. With our New state of the art Emmegi twin-head cutting-off machine center we have the capability to cut & feed profile to reduce handling and production time. The Emmegi twin-head cutting-off machines boast of exceptional performance characteristics, including ruggedness and reliability. This machine is the ideal tool for cutting aluminium profile in various thicknesses and at different angles. Latest generation machines which can make a considerable contribution to the production cycle thanks to their high standard of accuracy and user-friendliness. 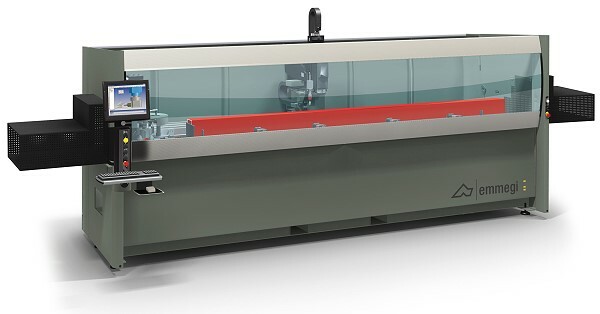 Twin Electra Sun is a twin-head cutting-off machine with 3 controlled axes. It features automatic traversing of the moving cutting head as well as electronic control of all the angular settings from 45° (internal) to 22°30’ (external) with accuracy on each degree of 240 places.